The technology of bell casting in our company has remained the same throughout generations since the foundry was established. 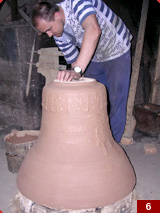 To make a new bell, a clay mould must be done using a special template. Every single bell, as far as size, weight and shape are concerned, has its own template. 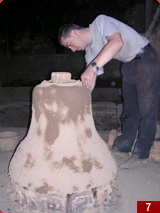 The production of a mould starts with covering the interior part of a bell, called the core, with bricks and clay. After the core is dried and burnt, the next part of the mould, called "the false bell," is formed by adding next layers of clay according to templates profile. The "false bell" is covered with unique ornamentation and letters made of wax, characteristic of a bell. The decorated false bell is covered with specially mixed loam in which all the elements of decoration are accurately impressed. The ready made mould must be dried. Next, the third and forth part, of the mould, called the case and the crown, are formed. The mould is reinforced with a wire, so that it is able to bear the pressure arising during casting. To prepare the mould to be cast, it has to be split into two parts, so that the 'false bell' made of clay may be removed. Later the exterior form (the case) with impressed ornaments and letters, is placed on the core, dried and placed in a casting pit below the furnace. When all the forms are covered with sand, corridors, through which melted bronze will flow from the furnace, are built. After three days when the alloy cools down, the bells are excavated, the wires are taken down, the clay is removed and a bell appears in full colours. The next stage consists of cleaning the bell from clay and adhering mould material, grinding, polishing and painting. A frame and a clapper, which is forged from iron, still have to be made. After proper installation and placing the clapper inside, we can hear magnificent sound and tone of the bell. Specially chosen parameters of stencil (thickness, profile, diameter), which determine weight and profile, as well as an alloy of metals forming raw product, decide about sound, timbre and tone of a bell. 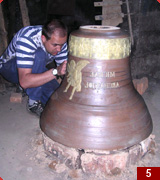 Tin implementation in bronze, has a major influence in sound production of a bell. The more tin is implemented, the clearer and softer timbre becomes. Since tin makes bronze harder, there is consequently a greater risk of cracking the bell. 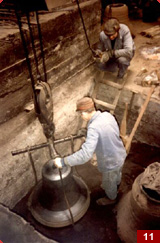 The timbre of a bell cast from improper materials is muffled, as if the bell were covered with snow or other material. Swinging a bell produces vibrations, which cause a harmony of high and low tones. That is the reason why the stroke of a clapper in a bronze bell gives an impression of the whole chord. When we thicken the sides of a bell, especially the rim, (thus increasing a bell`s weight), we get a higher tone; by thinning the sides, (thus decreasing its weight), we get a lower tone, while keeping the same diameter. Keeping a bell`s weight unchanged and increasing its diameter we get a lower tone and by decreasing the diameter we get a higher tone. Clappers are made of soft hammered steel, its average weight should constitute 4% of the overall bell's weight. A clapper should strike the thickest part of a bell, called a rim. 1. A bricked core of a future bell's mould. 2,3. The core is being finished - the interior side of the mould. 4. The ready made core is covered with the first layer of clay. It forms a "false model". 5. "False model" of a future bell containing final ornamentation, inscriptions - according to clients requirements. 6. "False model" is being covered with loam. 7. Making a case for a mould. 8. Moulds are being burnt. 9. The upper part of the mould case, is removed, with an impressed layout, seen as a negative. 10. The case is being burnt. 11. The moulds are being placed in the casting pit. 12. The mould is being put together, including the crown mould, in the casting pit. 13. Burning and melting in the furnace. 14. Molten metal is being poured into moulds buried in the casting pit.